Do you have problems remembering to blog? Or just want something else to blog about? Check out Blogger Class Mates! 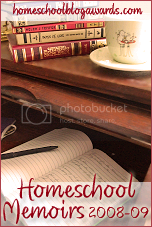 Created for homeschooling moms, but not limited to, as a way to get to know others around the blog-world in a fun and friendly way. Each Wednesday you receive an assignment to write about - something 'focused on strengthening and encouraging mothers in their faith, while enjoying the camaraderie of others.' Thanks Nikki for sharing!